The diagram shows all the usual xiangqi pieces, except generals are replaced by the kingdom names Wei (魏), Shu (蜀), and Wu (吳) representing the three rival emperors. The Green player has additionally its own distinctive symbols for its elephants (向 xiang ), cannons (礮 pao ), and soldiers (勇 yong ). The bannermen pieces (if used) start on the upper corner points of the players' 3x3 palaces. Game of the Three Kingdoms (Chinese: 三國棋, p Sān-guó-qí ; also called Sanguo Qi, Three Kingdoms Chess, or Three-Handed Xiangqi) is a three-player chess variant of the game xiangqi ("Chinese chess"). The game symbolizes the Three Kingdoms period war (221-264 AD) between the rival states Wei, Shu, and Wu, each vying for control of China after the fall of the Han Dynasty. The period of origination of Sanguo Qi is disputed and either belongs to the Southern Song Dynasty (1127-1279 AD) or the Qing Dynasty (1644-1911 AD). The two original Chinese texts which described the game are lost. O. von Möllendorff reported on the game in [German] "Schachspiel der Chinesen" (English: "The Game of Chess of the Chinese") in the publication Mittheilungen der deutschen Gesellschaft für Natur- und Völkerkunde Ostasiens (English: "Journal of the German Society for Natural and Cultural Science of East Asia"), Leipzig, 1876. 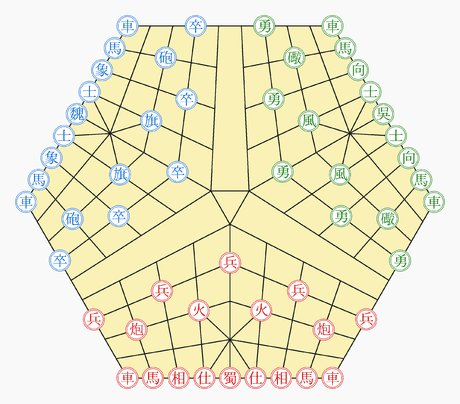 Möllendorff depicts a hexagonal gameboard comprising three xiangi half-boards (9 x 5 = 45 intersection points each). The board displays the traditional xiangqi "river", but with three arms separating the three opponent confrontations. Subsequent to Game of the Three Kingdoms, similar three-player xiangqi variants emerged utilizing half-boards but with different center connecting geometries and corresponding rules. One of these is Game of the Three Friends (Chinese: 三友棋, p Sān-yǒu-qí ; also called Sanyou Qi or Three Friends Chess) invented by Zheng Jinde (Chinese: 鄭晉德, Zhèng Jìndé) during the Qing Dynasty (1661-1722 AD). 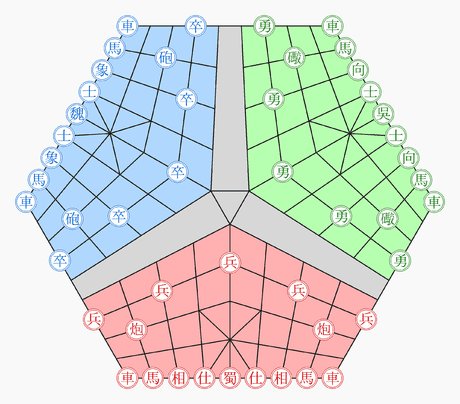 The diagram shows colored kingdoms for clarity (Wei/Blue, Shu/Red, and Wu/Green). This play setup is without the bannermen pieces, which are optional. 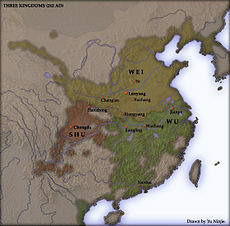 The three kingdoms Wèi (魏), Shǔ (蜀), and Wú (吳) are represented by colors blue, red, and green, respectively. Each player controls all the standard xiangqi pieces, with each general represented by the letter of its respective kingdom. In addition, each player controls two bannermen pieces: "flag" (旗 qí ) for Wei/Blue, "fire" (火 huǒ ) for Shu/Red, and "wind" (風 fēng ) for Wu/Green. The use of bannermen is optional - Game of the Three Kingdoms is also played without them. A bannerman moves like an extended xiangqi horse: two steps orthogonally, then one step diagonally outward, with no jumping. Checkmate and other conventions are the same as in xiangqi, except that after a checkmate occurs, the mated general is removed from the game, and the player who delivered the checkmate appropriates the mated player's remaining pieces for his own use. The last surviving kingdom (general) is the winner. Shu/Red moves first. Then turns alternate counterclockwise around the board. A chariot or cannon that reaches a central triangle point when travelling along a file, may cross the river in either of two directions and continue along the file of another kingdom. If reaching a triangle point when travelling along a rank, it may continue along the rank of the same kingdom, or cross the river in the same general direction and continue along the rank of another kingdom. After a checkmate, removal of the mated general and army appropriation are done in a separate turn. The piece delivering mate replaces the enemy general on its square. Stalemate results in the same army appropriation as described for checkmate. If two players' pieces cooperate in stalemating the third player, the player making the move that completed the stalemate condition is the player who appropriates the stalemated player's army.